When you're planning your wedding, every detail counts. Those special touches you've been dreaming about can either break the bank or work within your budget. I work with brides with budgets of all shapes and sizes to create the perfect silk bridal bouquet of their dreams. 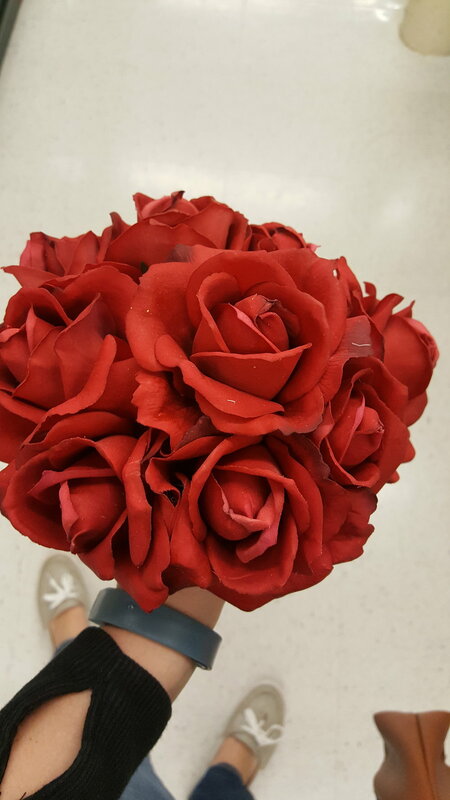 Catherine emailed me a few weeks back with a link to a bouquet that she loved. She was looking for a budget friendly silk bridal bouquet. The photo she sent was a classic rose bouquet with a shiny rhinestone in the center of each flower and some bling on the handle. Catherine was also able to email a picture of her dress so that I could match the color of the roses to the fabric as closely as possible. After a trip to my local Minneapolis florist supply, I emailed her pictures of the options that were available. When we compared her dress picture to the roses I found, we decided the first type was too bright tomato-y of red, the second was too pink of a burgundy, but the third was just right. With the roses decided on, like Goldilocks, I tra-la-la'ed off to my studio to nap...not really, but that would have been nice. Catherine really liked how the original bouquet looked and no changes were in order, which made my job simple! I created a modest size bouquet, threw in a dash of bling, wrapped it up with matching ribbon, added on more bling along the top and bottom of the handle and called it good. I mentioned a groom's boutonniere to Catherine and she was excited her man could wear a matching flower. I used a single rose, some greens and the same ribbon and she loved it. Take a look at this budget friendly silk bridal bouquet and groom's boutonniere! I know that, as you've been planning your wedding, you've been dreaming of every detail down to your bridal bouquet. If you're working on a tighter budget (and who isn't these days?) send in our Bride's Checklist for a FREE quote and see if our budget-friendly flowers are a good match for you!